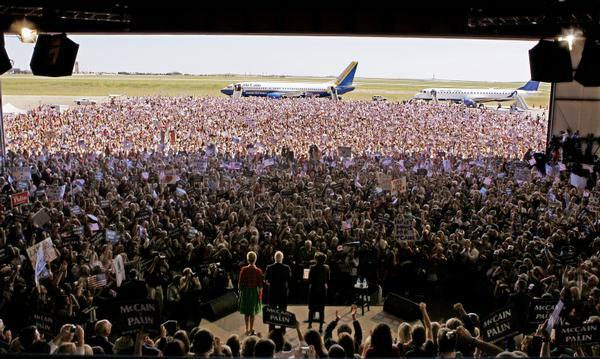 From this AP photo it appears that John McCain and Sarah Palin had a bigger audience in Colorado Springs that they did in the Republican Convention. This kind of exposure presents an interesting challenge. The good news: Campaigning in the Internet age provides a wider audience than ever before in history. she could be a great inspiration for young women everywhere. to: "McCain-Palin: New Energy for America." Watch Sarah and John speak in this Colorado Springs Gazette video and decide for yourself. I plan on covering Obama’s appearances as well as the McCain-Palin appearances. I think there is a lot to be learned in this campaign and will try to identify what I find most encouraging from each viewpoint. As a long-time Independent voter, I welcome the fact that this election may produce real change in government. I would only hope that the changes bring us to a more centrist operating basis where people can work out their destinies with fewer government restrictions. This entry was posted in 2008 Presidential Campaign and tagged Beldar, Colorado Springs, John McCain, Presto Pundit, Sarah Palin. Bookmark the permalink. Maybe you should be the one writing their campaign slogans. That was pretty impressive. David responds: The slogan was Beldar’s suggestion. I just found it and repeated it because I felt that it fit. as always, david, let us not forget to weed thru the propaganda to get to the real people. Campaigning is a “show” with the best writers, producers, etc. I am waiting for the debates. Unfortunately, we will probably not see Ms. Palin debating….as I think that would be very telling. You say she is an inspiration for young women….why? Because she has a good body? Great hairstyle and wardrobe? She is a good speaker.??? Beyond that type of “glamour” I cannot imagine wanting to look to Sarah Palin for an ounce of anything. I see her as a manipulating, narrow minded person and I am very disappointed that we, the people, are so gullible and influenced by the “show”.